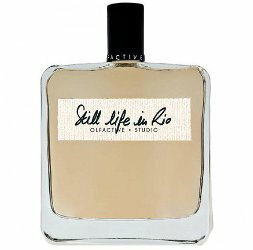 Still Life in Rio,the ninth release from French niche line Olfactive Studio, is a tribute to sunrise in Rio de Janeiro, "the city of wonder, enveloping and magical." It was developed for Olfactive Studio by perfumer Dora Baghriche (Arnaud) and its composition includes top notes of yuzu, ginger, mint, lemon and mandarin; heart notes of Jamaican hot peppers, pink pepper, black pepper and coconut water; and base notes of rum, Brazilian copaiba and leather. I just reread my review of Olfactive Studio's original Still Life (also developed by Bachriche), and I can see how this fragrance was designed to play off that earlier release: it's a "cocktail" of citrus top notes, a peppery heart, and a sheer wood-y base with a suggestion of rum. However, it turns up the volume by adding even more tartness to the fruity introduction (lime as well as yuzu, lemon, and orange? ), increasing the spice (pepper and ginger) and adding an airy coconut note. I'm actually reminded a bit of Creed Virgin Island Water's tropical mix of citrus, ginger, coconut, rum and musk, although Still Life in Rio feels more substantial. (I can't find a sample of the Creed in my collection, so I'm relying on my memory here.) The dry down has a touch of sweetness under the citrus and spice. Still Life in Rio's sillage and staying power are moderate. 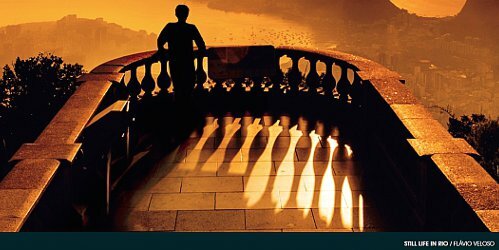 I was impressed by Olfactive Studio when I first encountered the line in 2012, and I've stayed sufficiently interested to try most later releases. I've always liked Olfactive Studio's photography theme, and I wish they'd come up with some other photo-related name for this scent (Aperture? Lens Flare? Still Life in Focus?) rather than straying into "destination" territory. However, its title can probably be explained by its timing — as one of you has already astutely noted, this fragrance is well-positioned as a nod to the 2016 Summer Olympics in Rio. Olfactive Studio makes smart, well-packaged fragrances, and it doesn't need that kind of topical gimmick (which, if we're guessing correctly, seems more like something Bond no. 9 would do). It also doesn't need promotional copy like this: "While the art of light shines through this new creation, this sunny perfume is best described in terms of starlight, the primeval flicker." Sure, I like wearing Still Life in Rio, but I'm also hoping that the brand doesn't lose track of its original mission. Olfactive Studio Still Life in Rio Eau de Parfum is available as 50 ($145) and 100 ($195) ml Eau de Parfum. For purchasing information, see the listing for Olfactive Studio under Perfume Houses. I quite enjoyed wearing Still Life in Rio from a sample I have gotten some time ago. I liked it enough to write a review in which I wrote that to me it smelled like citrusy pinacolada (citraconada?) I also enjoyed the fizziness of ginger. I like the fizz that the ginger adds, too! The original Still Life felt more “crisp,” whereas Rio is warmer. I’ll go read your review now! Ever since Paprika Brasil I’ve been very drawn to the smell of peppers. The hotter the better! That one still has my top spot, though. Any chance this one has actual heat? Ah! No, it’s peppery, but not *hot* peppery. I think you’re better off sticking with Paprika Brasil… or L’Artisan Parfumeur’s Piment Brulant, if you can track it down! It’s an interesting line. I’ll try to sample this new one, too.